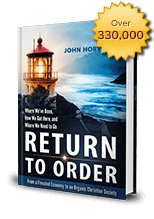 I received a very interesting e-mail from a gentleman who has bought the book, Return to Order, and raised a number of very intriguing questions and comments. His concern is that the book misdiagnoses our modern problem by not going straight to the root of the problem – capitalism. To get results, he claims, one must have the courage to reject capitalism in all its forms. Capitalism is a spiritual problem that embodies materialism, scientific utopianism, and libertarianism. He affirms that a careful reading of Saint Thomas and papal encyclicals over the last century warns us about the materialism of our days that has its origins in capitalism. Of course, I agree with the writer that materialism, scientific utopianism and libertarianism are all effects of the present crisis. Each of these and many other effects are dealt with extensively and condemned in Return to Order. I would, however, disagree that we should call the cause of these errors “capitalism” for three reasons. The first reason is because the word is ambiguous. It has many meanings. Some interpret it to mean a system that created all the evils mentioned by my correspondent. 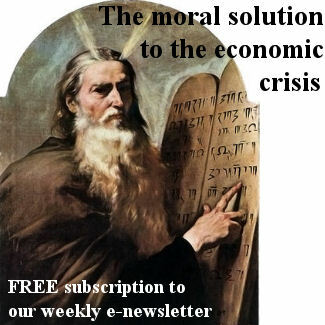 Many simply equate capitalism with a market economy which has always been defended by the Church. By condemning one meaning, we risk condemning the other unjustly. I might further note this has been the prudent policy of the Church over the last century. The Church has often spoken out against the abuses of “capitalism” such as materialism, individualism and scientific utopianism. However, it has never roundly condemned “capitalism” as such, lest it condemn inadvertently the market economy and other legitimate ways of conducting business. This position is found perfectly laid out in John Paul II’s 1993 Encyclical Centesimus Annus, where the distinctions between the word’s diverse meanings are well noted. There is another reason why I do not use the ambiguous term “capitalism.” It is the term of choice of the Church’s enemies. Communists and socialists have always employed the tactic of using the very ambiguity of the term to unite useful allies to their cause. The Church cannot make common cause with those who hate and actively work to destroy Her. Marxism in all its forms is responsible for far more crimes against humanity and Holy Mother Church than any other system conceived by man. It makes no sense to join with those who use the term for their own subversive purposes when we have all the doctrines and means at our disposal to deal with the problem. Finally, the last reason why I do not use the word “capitalism” as the cause for the present ills is because it cannot be the root cause of any moral decay. The cause must be found within man himself not inside a system. It is one of the errors of Marxist analysis that stipulates that it is social structures and economic systems that cause the evils of mankind and not the sins and defects of character of man exercising his free will. To affirm that a system determines the behavior of men is to say that he has no free will. Systems can influence us and favor our defects. However, this is ultimately a spiritual problem. That is why we must look for a moral defect that explains the crisis we face. One cannot, for example, fault the restrictions of the institution of marriage to explain the rise of a permissive society. Rather the causes must be found in the moral defects of sensuality and selfishness which in turn bring about the abuses. That is why I chose to coin the term “frenetic intemperance” to explain the phenomena inside the human soul that gave rise to the economic imbalance and frenzy we see today. One may disagree with its exact formulation, but it is a term that describes a moral defect that can be observed in history as it creates the imbalance that has plagued modern economy. It helps explain the rise of materialism, scientific utopianism and libertarianism. In short, the term goes to the root of the problem deep inside the soul of modern man. 1 Bernard W. Dempsey, The Functional Economy: The Bases of Economic Organization (Englewood Cliffs, N.J.: Prentice-Hall, 1958), 162. This entry was posted in Featured and tagged capitalism, Christian principles, cruise, debt, economy, financial speculation, Institutions, organic Christian society, Sequester by John Horvat II. Bookmark the permalink.